It’s not often we promote events that aren’t actually our own on the blog, however this particular one is national , it’s free and it’s aimed specifically at IT support companies and MSP’s like you who want to make your business more profitable. It’s also the brainchild of the highly acclaimed IT Marketing Agency and industry expert Richard Tubb, both of whom stole the show at our recent partner event so we have no doubt it’ll be of the usual high calibre and well worth your valuable time. Edinburgh, Murrayfield Stadium – 20th July 2015 – Register now! Newcastle, St. James’ Park – 21st July 2015 – Register now! Manchester, Old Trafford – 22nd July 2015 – Register now! London, Emirates Stadium – 23rd July 2015 – Register now! It’s a fantastic agenda with plenty of content for you to take away and take action on so be prepared to make plenty of notes! Kicking off the day will be a vendor neutral presentation from leading voice for the IT industry CompTIA. Presented by Sylvia Collins. Richard Tubb will be joining Gemma Telford of the IT Marketing Agency to reveal the most innovative and powerful marketing and sales solutions being used by MSPs and resellers today. Andy Pope is MD of Consort Group, a successful collective of Managed Service Providers who are working collaboratively to leverage their strength, improve their businesses and win nationwide opportunities. Richard Tubb will be hosting a Q&A session with Andy about exactly how they’ve done it. This Quick Start session presents six strategies for gaining the greatest benefit from your investment in vendor partnerships. Presented by Sylvia Collins. Plus there are other sessions including Building Your Margin: New Solutions with Epson, The Complete Data Protection Platform – A Breakthrough Solution for MSPs fromInfrascale, Building Your Business with AVG – Partnering for Growth and a presentation from James Foxall, CEO of Tigerpaw Software. On top of that I understand there will be a complimentary lunch, time to network and a tour of each of the stadium’s we’re visiting too! 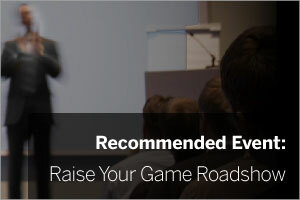 To register for the Road-show visit the Raise Your Game site and sign-up. I’ll be attending the Manchester event hoping to so I hope to see you there!